The workshop included a small-scale recreation of choreographer Willi Dorner’s piece ‘Body in Urban Spaces’. The workshop began with an introductory lecture on art in public spaces, followed by five meetings in which Mr. Dorner worked together with the 30 participating students to create a piece. The workshop and the concluding performance took place in the school’s public spaces: classrooms, yard, library and basketball court. The performance was a weaving, choreographed line of children, who led the audience through the various spaces in the school. In each space the children created a momentary formation, which enabled the spectators to see familiar spaces with new eyes. 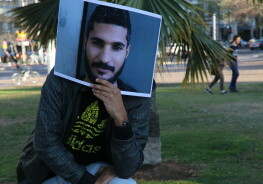 The whole process was documented and photographed, and following the performance, the photos were exhibited around the school. As part of our educational approach at Kelim, we believe that this workshop/performance is an experiential process; it is physically challenging, encourages creative thinking, and invites the students to be involved in and influential on their environment. Noa Eshkol and Prof. Avraham Wachman developed the Eshkol-Wachman Movement Notation, a revolutionary notation system, as a tool for creative dance work. The Eshkol-Wachman notation system is taught at the Tel Aviv University, the Academia of Dance and Music in Jerusalem, the Kibbutzim College and at various dance elective programs in high schools throughout Israel. The Noa Eshkol Foundation supports broader dissemination and use of the Eshkol-Wachman notation system, as well as further research in this field. The Chamber Dance Group continues to teach and perform Noa Eshkol’s pieces. ‘End of the Wall’ is an instant composition piece, created collaboratively by a group of artists from Israel and India. In this work the artists explored ways to communicate and create together by overcoming their geographic distance and cultural differences. We chose to look at each other’s daily lives in the private and public spheres and share the personal and social challenges each reality presents. Technology allowed for communication and initial connection, and highlighted the similarities between the two groups, as artists who face the political and religious complexity and tension inevitably produced in traditional societies comprising different ethnic groups and communities. Technology blurs the differences between our cultures, religions and social classes. 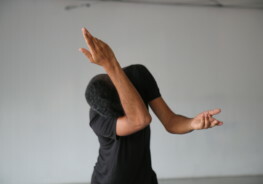 ‘Yesh Beze Tom’/’Naive’ was created as part of the ‘Dance and Community’ program at the Kelim Choreography Center. 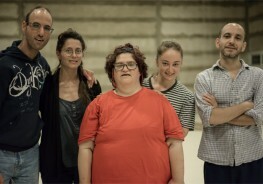 The piece premiered in the Bat Yam Festival in August 2017. I wanted people of different ages and backgrounds to come together in this piece, to connect between the young and old and between professional and amateur dancers. The collaborative nature of this work’s process allowed the different participants to share their knowledge and approaches. 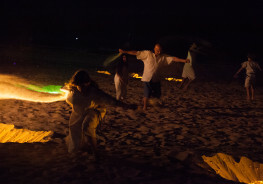 Using the sandy beach of Bat Yam as our venue, we created a piece which combines emotions and movement, light and darkness, performance and ritual. The performers dance together in circles that repeatedly form and disperse, becoming a ‘tribe’ and then dividing into smaller groups. At times, the onlookers may catch a glimpse of a movement/gesture that alludes to caring, closeness, intimacy, eagerness, or playfulness, which grants the piece an air of naivety. enough to hold back energy from bursting in. I couldn’t ignore the noise. (Even if) I swallow a mushroom to sharpen my consciousness, the pain only intensifies. To where did I think I was escaping? I am here, and yet I feel the flow of pain even stronger. All my preparations, the things and objects I brought with me, even soil from just outside the building, all look wrong inside the studio. They pale in comparison with this town’s energy. I don’t know what I was thinking, but it’s not working. I must be in constant motion here. I got stuck in a loop. This studio is one, big sound box. Every five minutes an airplane passes overhead. I decided I must utilize the sounds and noise bursting in to survive this experience. When I stepped outside the studio I started to understand what was going on around me. It scared me. The studio is in the town’s industrial zone, adjacent to a strip of land where there once was nature and now only a few scrubby, stubborn plants remain. I visited the last sand dunes that will soon be taken over by trucks and concrete, and gazed up into the sky, only to find the aircrafts, whose noise was infiltrating the studio’s walls, transporting passengers to Europe and America. Everyone dumps their garbage on this little strip of land, which is turning into a brown-field. If everyone does as he pleases, then so must I. This is a psychedelic frontier, an existential residency in ‘Kelim’. This work is an environmental sound pollution piece; this is surviving the noise. ‘The Voices’ is a collaboration between May Zarhy and Michal Oppenheim Landau. 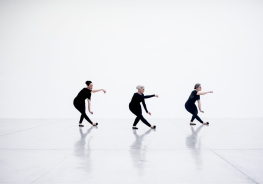 This time they brought together an ensemble of women dancers and singers to explore the space between the media of music and dance, comparing between the tangibility of voice and that of movement. The result is a choir that is not confined to the medium of voice alone, but flows between body, voice and vibration, and aims to create a third medium that is neither song nor dance, yet both at the same time. Tamar Lam and David Kern’s piece “Dog Walkers” comes into being at the confluence of dance, performance, and live music, while adhering to an organizing principle that allows the piece to be structured and fluid at the same time. Scattered throughout the space are objects that allude to a specific cultural context: a deck of cards and a cigarette lighter, a guitar and ukulele, books, microphones, plaid shirts, cowboy hats, and two large cardboard dogs. Sentimental folk songs play in the background. The objects, like the movement, have a reciprocal relationship with the semi-fantastic/humoristic and semi-realistic narrative that gradually unfolds. At certain moments, the movement leads the performers to a specific object, whose identity is then defined through the performers’ bodies’ interaction with it. At other moments, an object functions as a visual and conceptual anchor for movements or for spoken words. 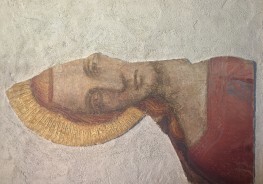 Thus is created a partitura of intimacy -love, yearning, and separation – that bridges the interstices of emotional perception and sensory experience. 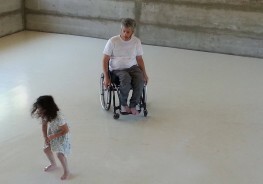 In this piece I explore the connection between art, fatherhood and disability. Paralyzed from the chest down, I am dependent on technology (my wheelchair). My body can be divided into 3 parts: the able top part, the paralyzed bottom part, and assistive technology, my wheelchair. For my children’s sake I try to put aside my circumstances and find playfulness and imagination within my limitations. In the safe space of Kelim’s studio I create movement, on my own or with others, and using my body, I experiment with movement in space. Shira Eviatar produced a new solo piece for the dancer Evyatar Said, in which she continues to explore how bodies of knowledge are expressed in the physical body. Eviatar and Said met in their neighborhood, Kerem HaTeimanim, Tel Aviv, at a mutual friend’s home. They decided to continue in the studio the organic conversation that developed during this encounter, to further delve into their shared curiosity of the presence of cultural traditions in the contemporary body/mind. 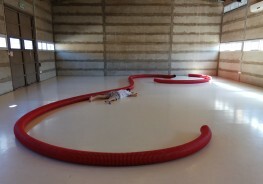 The piece outlines a personal cultural landscape: movements, dances, rhythms, gestures, values, and ways of thinking and communicating that are all part of a language acquired while growing up. In public this language was negatively labeled as “different”. Onstage, Said emigrates from his home, weaving and unraveling physical memories, sensations and feelings and celebrating the chance to create an independent existence. The piece premiered in the ‘Between Heaven and Earth’ Festival and was supported by the ‘Tights: Dance and Philosophy’ Artist-in-Residence program, and the Mifal HaPais Council for the Culture and Arts.